Get your roof looking great without a replacement. For sites that have a traditional elevated roof, a commercial power washing treatment can restore the shingles and give them a like new look. Mold and mildew stains can be removed without damaging the materials and restore the roof, saving you the expense of a new roof installation. Give your customers a positive first experience. Instead of customers having to walk through a dingy parking lot, a professional parking lot restoration can provide a great first impression. Parking lot restoration can remove discarded gum, oil stains and grime. Thorough restoration of siding. Mold and mildew can grow on your building’s siding, giving it a dull look. 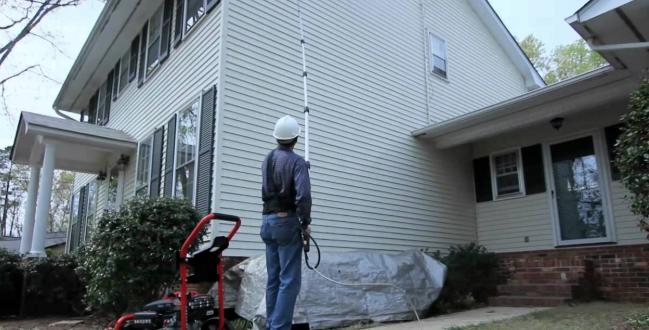 With a commercial pressure washing treatment, your siding will look new. Commercial power washing protects landscaping. Our teams of trained power washing specialists use more than just water to get your commercial site clean. In fact, we use biodegradable cleaners that not only remove grime, but that will not damage your landscaping investment. Rinsing is critical. Professional commercial power washing teams know that the finish is in the rinse. A three step rinsing process ensures that the siding, roof or concrete that is being treated has the best final result. Cal Code3Pressure Wash and take advantage of our commercial cleaning services! This entry was posted in Pressure Washing Articles and tagged commercial, pressure wash.
Pressure Washing Your Home Before Listing For Sale. Can Pressure Washing Your Home Help You Get A Better Price When You List It?